The landmark Paris Millennium Event was the occasion at which CMI announced the Millennium Prize Problems. About 500 people filled the Amphithéâtre Marguerite de Navare at the Collège de France. Many distinguished mathematicians and scientists attended for the afternoon, as did Professor Gilbert Dagron, who heads the Collège. The announcement in Paris marks the 100th anniversary of David Hilbert's lecture at the second International Congress of Mathematicians. Hilbert's blueprint for mathematics was more influential in setting the direction for 20th century mathematics than any other single event. The Collège de France provided an elegant setting to celebrate this anniversary. At a Press Conference preceding the public ceremony, the CMI Directors and Scientific Advisory Board described details of the Millennium Prize Problems to the press and other news organizations. Four statements were followed by a question and answer session. Speakers at the CMI Meeting were also available to answer questions. Before the public ceremony began at 2:00 pm, a brass quintet provided background music, a hallmark of CMI meetings. Welcoming remarks followed by Alain Connes, Arthur Jaffe, and Landon Clay, who emphasized "where there is mathematics, there is comeliness." Monsieur Finance, the representative of the Ministry of Education, followed with an entertaining welcome. After these introductions, a ceremony followed with a presentation of two Clay Research Awards. Andrew Wiles announced the award to Laurent Lafforgue and Arthur Jaffe announced the award to Alain Connes. Lavinia Clay presented the Ferguson sculpture to each winner. Following the Introduction, Timothy Gowers, a Professor at Cambridge University, gave the keynote address on the importance of mathematics. After a break, the meeting resumed with an historic recording of David Hilbert's voice from the 1930's expressing his views about the future of mathematics. "We must not believe those who today, with a philosophical tone and a hint of superiority in their voice, predict the fall of our culture and satisfy themselves with the ignorabimus. For us there is no ignorabimus and in my opinion especially not in the natural sciences. In the place of this silly ignorabimus, our motto should be on the contrary: we must know, we will know." Hilbert's words were symbolic for the occasion. 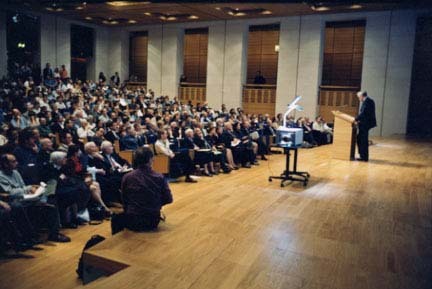 The talks that followed by Professors John Tate and Michael Atiyah set forth for the pubic the seven Millennium Prize Problems and elaborated their historical importance. French Minister of Research Roger-Gerard Schwartzenberg also spoke. An elegant champagne reception followed in the foyer outside the lecture hall. The next day, Laurent Lafforgue and the three long-term CMI fellows — Dennis Gaitsgory, Terence Tao, and Manjul Bhargava — presented mathematical talks.